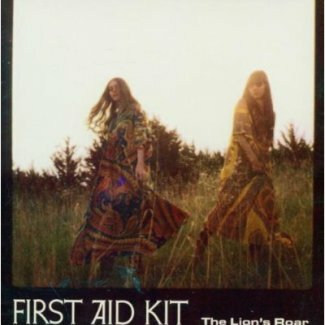 After one listen to The Lion’s Roar, the sophomore album from sister duo The First Aid Kit, the terms folk, alt country, twang all came to mind. That is until the band’s bio read “from Sweden.” Wait, what? Klara and Johanna Soderberg truly emulate the old adage that “music has no boundaries” as they perform heartfelt folk ballads as good as many of our country’s legends. Much like the duo’s idols, the ladies of First Aid Kit are just as much storytellers as they are mystifying singers. The duo touches on topics like the doldrums of long-term relationships (“This Old Routine”), missed chances (“To A Poet”) and religious doubts (the fiery “The Lion’s Roar”). At times, the charming harmonies and calming delivery has a way of masking the sad themes of the narratives the duo orates. “In The Hearts Of Men” shines as Klara speaks in paced stanzas as the narrator holds back true feelings to avoid hurting those around them. The bare bones auto-harp on “New Year’s Eve” provides the backdrop for a checklist of resolutions that seem to offer psychological reprieve. The aptly-titled “Emmylou” is a slide guitar-filled love song that doubles as an ode to singer songwriters of the past, name-checking Johnny Cash, June Carter, Gram Parsons and Emmylou Harris along the way. Much like the duo’s heroes, the Soderberg’s honeyed tones coat the song’s sadness with enchanting vocals. “King of the World,” the album’s most upbeat cut, is an apt way to close The Lion’s Roar. The Soderberg sisters (and a surprise guest appearance from Conor Oberst) work out their demons and emotions through story and influence of past greats on the album. Filled with handclaps, ukulele and horns, First Aid Kit still see saw about with observations ranging from self-doubt to carefree emotion. However, with the lines “I’m the queen of nothing/I’m the king of the world” give the duo a send off and foreshadows their bright future. First Aid Kit plays Black Cat on March 30.